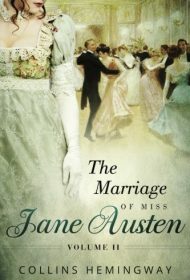 This eagerly awaited second volume of The Marriage of Miss Jane Austen trilogy sees Jane married and busily engaged in learning to manage a large house and servants and sharing her husband’s scientific and business interests. Here again is a strikingly real Jane Austen fully engaged in the turbulent times of her country. The story is set in 1806, a time when England’s triumph over Napoleon at Trafalgar finally frees the country to concentrate on other issues. Mindful of this, Austen’s husband, Ashton Dennis, invites a group of entrepreneurs and thinkers to brainstorm new ways to propel England into the new century. Hemingway smoothly incorporates their ideas for harnessing electricity, increasing manufacturing, and building railroads for efficient transportation of goods. Inevitably, some individuals question the fate of workers if machines replaced them. Arguments of men versus machines lead to questions regarding slavery’s morality and create a growing rift between Jane and Ashton and their friends Colonel Lovelace and his wife Kat, who own slaves for their Jamaican enterprises. Although Jane’s days are filled with the domestic duties of women of her station and the support of Ashton’s scientific and business ventures, she misses having the time to write as when she was single. Her attention shifts even more when she becomes pregnant. Author Collins Hemingway is firmly in his scenes, skillfully drawing readers into Jane’s world, whether describing the French influence on women’s fashions, the emotional and hormonal changes of the pregnant Jane or the controversies regarding Lord Elgin’s plundering of ancient Greek sculptures. Jane’s voice is particularly strong in her letters to her sister Cassandra and her deep affection for her brothers. In Hemingway’s hands, she is a living, breathing presence—a vibrant character Austen herself would applaud. The book concludes, as it began, with the investors again gathered to evaluate progress of their ideas — and with clues about the trilogy’s final volume, coming in 2017. Readers will be enthusiastically awaiting its release.